Seven UNO cards were spread out like a fan in my hand. There were four greens, two reds and one blue. The card facing upward on the table was yellow, emblazoned with the number “5”…just about the only number and color not represented in my hand. Anyone who has ever played the card game could see that this was an unlucky grouping. My daughter, who was nine years old at the time, smiled like the cat that ate the canary. Never one to present a poker face, she picked the last of her own seven cards from the thick, worn pile. I looked down at my cards again, knowing I would have to pick yet another in a game that required losing all to win. She was right, of course. So I picked the first card lying face down in the pile. It was a blue eight. The next was a green “skip” card and the one under it was another green three. 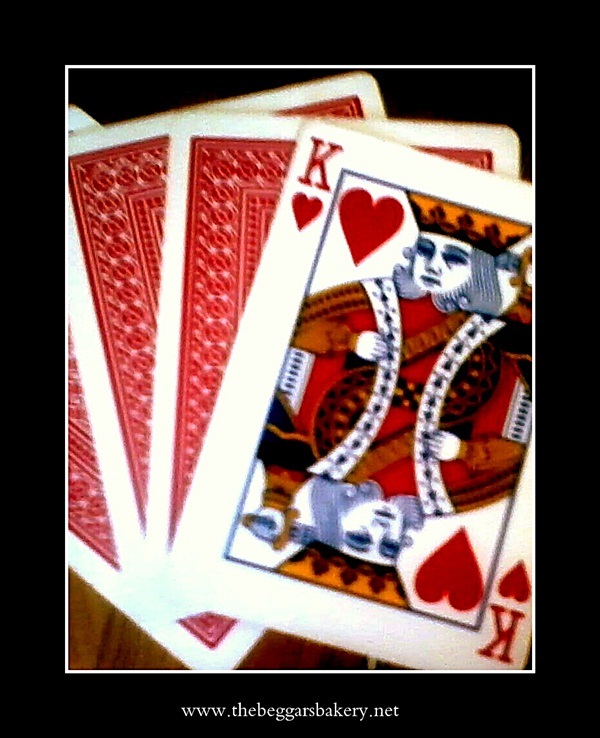 “Dos, tres, cuatro,” I counted, my hand becoming heavier with the losing cards. “You will have catorce soon!” laughed my opponent. “Catorce” is the Spanish word for fourteen. “I must not have shuffled them well,” I grumped. “Maybe not,” she said. “But you have to play the cards you’re dealt.” How many times had I told her that? It was not, in fact, until I did have fourteen cards that I was able to get rid of even one of them. By the time I chose a winning card, there were too many to hold in fan formation so they fell about in a messy heap that allowed my opponent to see which colors and numbers I held. Miraculously, though, I won the game that day. I kept choosing and she kept laying down her cards until she was forced to play a green one. She had been holding on to not one, but FOUR wild cards – pieces that entitled her to change-up the game in her own favor all along. Somehow, using all of her good cards had resulted in her ending up with green cards. And green cards I had! It seems to me that many people are dealt unfair cards in this life. Some are given wild cards in abundance, while others have a handful of “fives” without any apparent significance. I didn’t mean to choose the hand of proverbial cards that I had to play in the darkest times in my life, but I did pick many of them myself. I hadn’t wanted to grow up to be an alcoholic. I don’t remember picking the card for divorce that showed up in my deck. And single motherhood? I’d have just as soon left that one out, too. Chronic pain, financial struggle, surviving abuse….I’d never have asked for them. So many issues – more than catorce! – that my hand could not hold them all, spilling out of formation and into a messy heap. And when you have a big enough pile, you can’t hold them close to your chest and they fall about you for all the world to see. For your opponent to see. I didn’t ask for that messy pile. Even though I often contributed to the disorder with my own actions, it still seemed unfair. Sometimes I’d done all the right things – shuffled well. Still, bad things happened, things that made me hurt deeply. But He had purpose all the while. I found out that there is a huge difference between perceived unfairness and purposeless-ness. All of the losing cards I’ve held have played pivotal roles in making me understand what God’s grace is all about. I wouldn’t trade that card for anything. We all have to play the cards we are dealt – in a game that often requires losing all of self to win. Keep picking up the next card, believing that God will work it to the good. Believe it, and ask him to fill in the gaps where you do not believe it yet. And lay them down; keep laying your cards on the table – on the altar. This is beautiful, Jana. If I had been able to read it a couple days ago it wouldn’t have meant the same thing to me as it does today. Your posts always seem to reach me at just the right time! You are soooooo wise my friend, So wise. I learn grace from your writings everytime! Nah, Linda. Not so wise…I have to learn everything the HARD way. But I am very blessed. Love you! (((Karen))) I am so glad. God is always working “behind the scenes”, is He not? I can say the exact same thing about your posts. Hugs today!